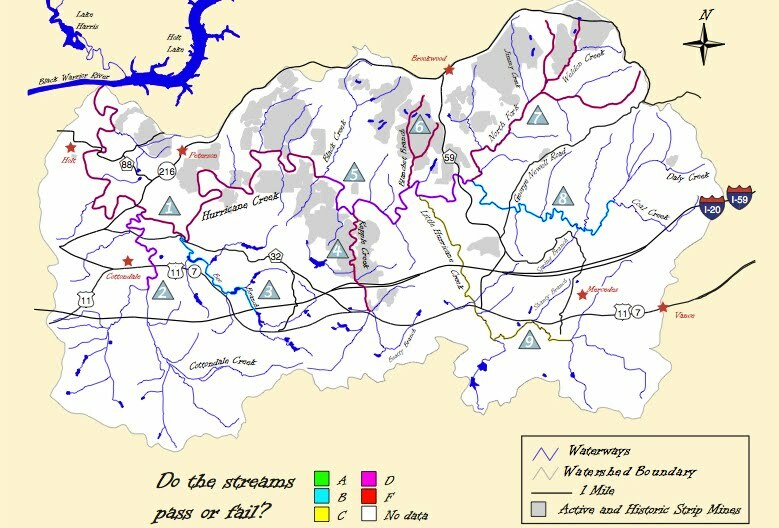 This map shows the health of individual streams within the watershed. Download an larger PDF copy. 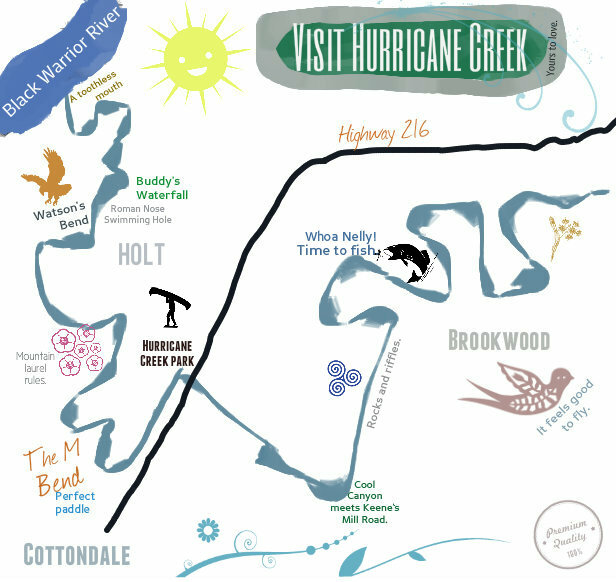 The upper reaches of Hurricane Creek are located in east Tuscaloosa County. The creek flows south and west from the town of Vance to the Black Warrior River at Holt. Pronounced "HAIR-uh-kin" Creek by older residents, the waterway often produces a roaring sound like a hurricane as it rushes over its rocky bed. It flows from the confluence of Davis and Coal creeks in the town of Vance and runs west for approximately 26 to 28 miles. The creek also meanders through the communities of Brookwood, Vance, Peterson, Coaling, Cottondale, and Holt, where it enters the Black Warrior River. 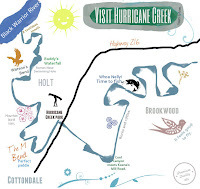 The Hurricane Creek Watershed includes Hurricane Creek as well as its five major tributaries, including Kepple Creek, North Fork, Little Hurricane Creek, Cottondale Creek, and Bee Branch. The USGS designation for this watershed is HUC 03160112-120. Hurricane Creek is home to a variety of plants, animals, invertebrates, fungi, and microscopic creatures. Each organism plays its special role in the creek ecosystem- a role that no one can play and no machine can mimic. The stream flow is part of a continuous cycle in which life flourishes and changes. Learn more about the life along Hurricane Creek. Hurricane Creek's banks are bordered by a wide variety of trees—including birch, beech, oaks, poplars, sycamores and Southern longleaf pines—that form a tall canopy. Understory trees include dogwoods, redbuds, and hollies. Stands of big-leaf magnolia, known locally as "cowcumbers," can be found in most every plot of woods along the creek course, producing large white flowers in late spring. Cedars that line the creek are so massive that they may predate the arrival of white settlers to the area in the 1820s. Inhabitants of the stream itself include an increasing number of fish species and equally increasing overall populations, including spotted gar, catfish, bass, and bream. Pools topping sandy beaches adjacent to the creek often include tadpoles, and boulders in the stream host slugs and snails. Frogs are large enough for gigging. Insect life includes damselflies, Alabama's state butterfly, the eastern tiger swallowtail, and the state insect, the monarch butterfly. In the the creek itself, mayfly, stonefly, and caddisfly larvae thrive. The most recent TMDL shows that metals are the most significant stressor to wildlife and invertebrates in Hurricane Creek. The EPA recommended a 75% reduction in the daily load of metals flowing through creek water. That is no small sum! As the creek meanders and snakes through the county, it passes through several areas of abandoned strip mines as well as some current mines. The mines have their own history detailing a dismal relationship with their environment. During the 1920s, pollution from primitive strip mining caused large-scale fish kills and widespread siltation of the creek. Legal action stopped the mining, but the environment required decades of recovery. In 1944, Reichhold Chemicals Inc. began manufacturing organic chemicals, synthetic resins, and various industrial chemicals, operating until 1986 on the Black Warrior River near the creek mouth at Holt. From the beginning, it was accused of dumping barrels of dye into the creek mouth. Officials administering state and federal rules historically reported findings of environmental compliance, but the site continued to be monitored from time to time by the U.S. Environmental Protection Agency. Due to a private-citizen complaint lodged to the EPA, the agency says it investigated the acreage in Spring 2010, reportedly finding no problems. It admitted, however, that the investigation did not include Hurricane Creek or its banks. Plans reportedly call for the agency to conduct further inspection later in 2010, which would include focus on the creek and adjacent land. Strip mining continues to cause siltation in the creek, as does nearby construction, road building, coalbed methane well procedures, road maintenance activities, and runoff. In 2008, raw sewage seeping into the stream caused a temporary ban on fishing and swimming in the creek. These abandoned mines and current mines pose a continuing threat to the creek's health. For many miles it travels through places where the surrounding land was scraped clear of all topsoil and of nutrients for the creek. This bare soil had been eroding for decades, leaching heavy metals into the stream piggybacked within acid water. We have found tributaries with a pH reading as low as 2.9 (lemon juice). It is in one of these streams that we have been able to enlist the help of a group of environmentalists, industrialists, and enforcement agencies to begin reclamation and recovery of one of these sites. Weldon Creek is just the tip of the iceberg. There are many, many more sites as bad or worse than Weldon Creek that need to be addressed before we can stop our work. Sedimentation and erosion affect stream flow. Usually, we use turbidity to measure sedimentation (though it is far from perfect as a measuring tool). Turbidity occurs due to suspended solids in the water. It is attributed to mining and land development . When land developers build new residences or buildings, loads of sediment are excavated and shifted around. When there is a rain, the sediment that has been removed from its insitu position is carried away in the rainwater. Storm drains carry the water into the waterways. Sudden increases in streamflow can cause streams to erode their banks more, increasing the sediment loads being transported. There is some uncertainty as to whether sediment is the major contributor to turbidity, since turbidity can also be caused by algae, microorganisms or organic material. According to the most recent TMDL, waterkeepers should strive for a 32% reduction in turbidity in Hurricane Creek. Much of this reduction would occur if building companies implemented best management practices for stormwater runoff. We know that best management practices can be successfully applied at the creek (see the example of Scott Bridge Company). The most recent TMDL aims for a 67% reduction in daily loads of pathogens flowing through the creek. There are, however, a number of clean-running tributaries that supply enough clean recharge water to keep the stream alive and in recovery. We are beginning to see more of the native grasses along the bottom of the creek, where there used to be only mud and sand. Some of the large gravel (point) bars are moving downstream, gradually making their way to the Warrior River where they become a huge problem for towboat navigation in the lower reaches of the river. In 2012, Creekkeeper John Wathen documented fish swimming in the creek- a hopeful and beautiful sight. If we can keep the bulk of erodible material out of the creek and work with local businesses to use best management practices in the watershed, Hurricane Creek has a chance to be a viable, healthy asset to the continuing economic growth of Tuscaloosa County. A healthy recreation and research area this close to a major university would be valuable in the future, given the new center for water studies currently being developed at the university.